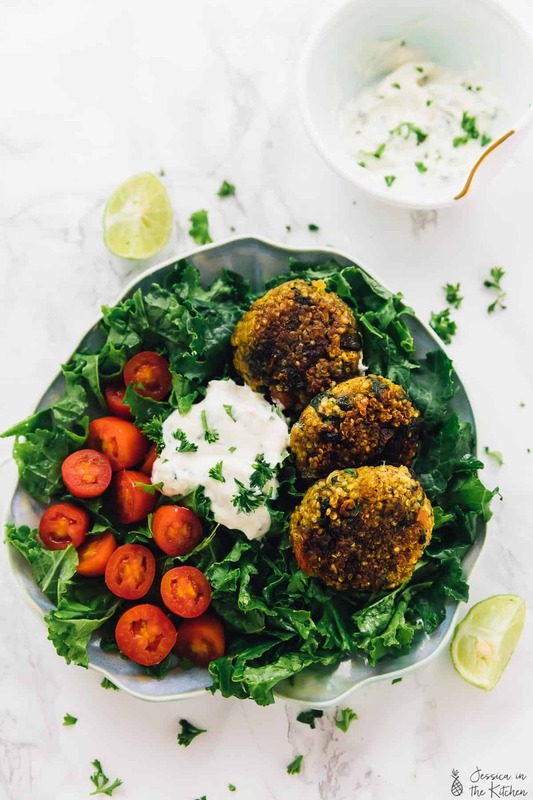 These Crispy Quinoa Patties are so great for meal prep! 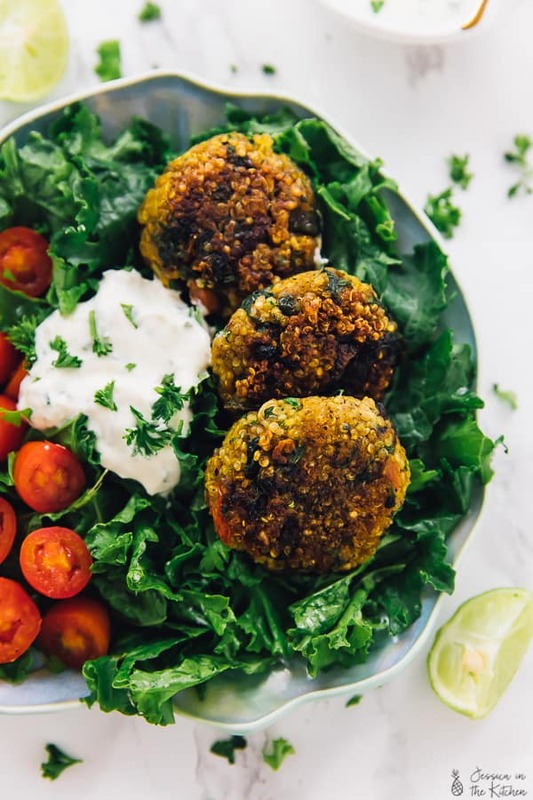 They are made with spinach and tomatoes, are vegan and gluten free, and are served with a divine vegan yogurt tahini sauce! There are two things you’ll never see me eating: cilantro and a boring salad. Speaking of which, are you on team cilantro or not? Apparently I have that gene that makes it taste like soap. Bleh. Anyway – on to a boring salad. Hate is a strong word. However, I really dislike eating at a hotel or a restaurant, asking for a salad, and being served a really sad, sad mixture of dry, week old pale lettuce with sad tomatoes who weren’t properly loved. I mean, why do people think I want to eat this ever? I will never do this to you. In fact, whenever you see a salad on this blog, know that it’ll be OVER the top, loaded from top to bottom, and definitely filled with flavour. It’s just what we do at JITK, ya know? You know what tastes amazing by itself, and on salads? These Quinoa Patties. What do you call these? quinoa cakes? Quinoa patties? Either way, you’re going to want to try these. I’ve been going through my fridge, thinking up new ideas for you, and this came to mind immediately. 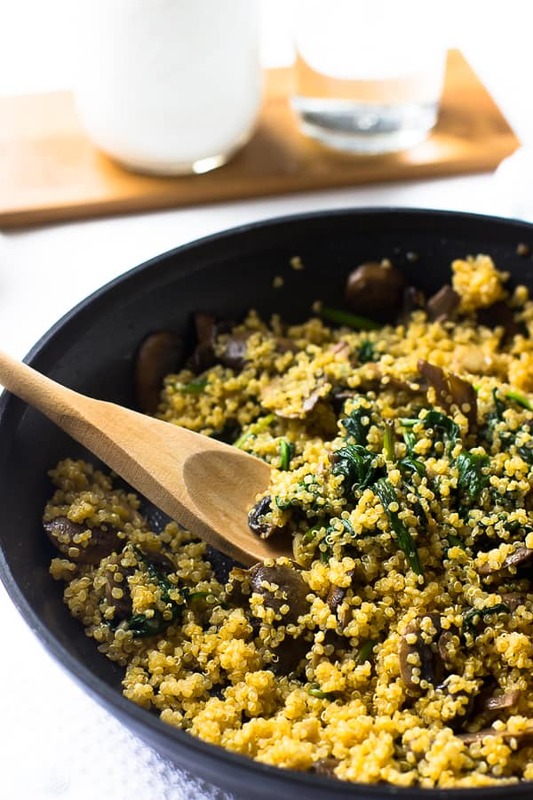 We almost always have quinoa in the fridge, waiting to be reinvented, and we grow spinach in our backyard. I tried the tomatoes but…the sun literally scorched the buds. Alas, I will try again with those. So for now, the farmer’s market provides us with yummy, fresh and well nurtured tomatoes. I digress. 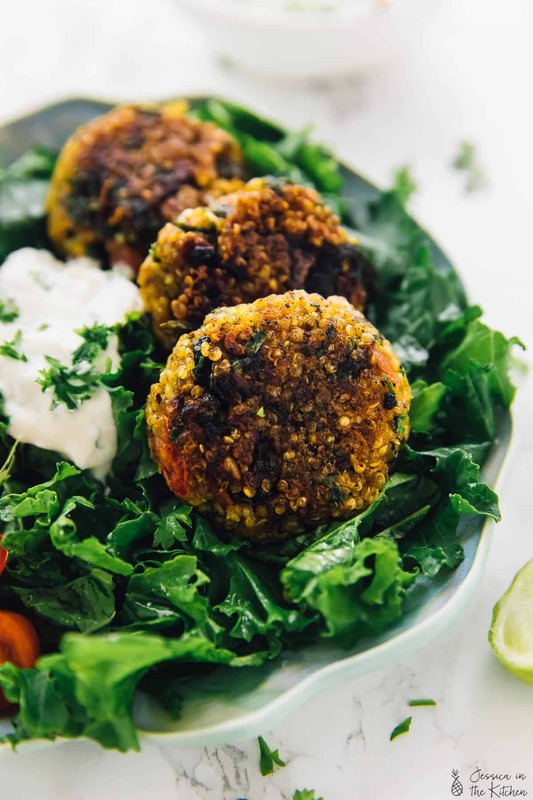 These Quinoa Patties are a real wonder that happen to be vegan and gluten free too! They are beautifully crispy on the outside thanks to pan-frying. You could probably make bake quinoa patties too! I would start at 450 degrees for 10-15 minutes to crisp the outside while cooking the inside. The spinach and tomato go together well here. You could even sub sun-dried tomatoes for even more beautiful flavour. A big question is – how to make these stick together with no eggs? For a recipe like this, I wouldn’t use flax eggs. I would definitely use an egg substitute such as Bob Red Mill’s Egg Replacer, since it acts as a glue the way a real egg would. I packed them with so much juicy flavour that the Mr. was casually snacking on them by themselves. That is, until he saw the Yogurt Tahini Sauce that I made to go with them. That sauce, omg. I mean, can I slather it on every salad green for the rest of my life? 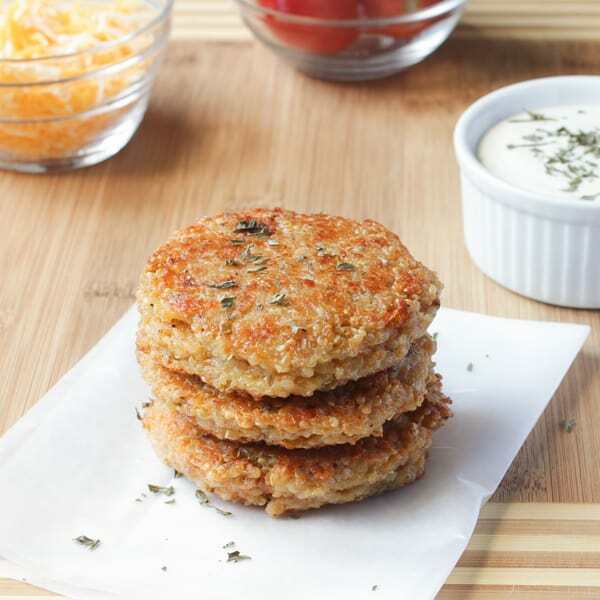 I compare it to these Quinoa Patties like tartar sauce to salmon cakes. They go really well and really complement each other, so ensure you make them too! Q: If I’m not vegan, can I use regular eggs and greek yogurt? Q: Can you freeze these quinoa patties? A: Yes you can! Cook them first, then freeze them by placing them in a zipped freezer bag separate by wax paper. You can thaw them in a pan on the stove or in your fridge, then reheat in your oven or toaster oven. Q: What do I serve these quinoa patties with? A: You can serve them just like how I did here! They go great with salad greens and extra fresh tomatoes, or even in a pita bread like a falafel with the sauce used in that way. 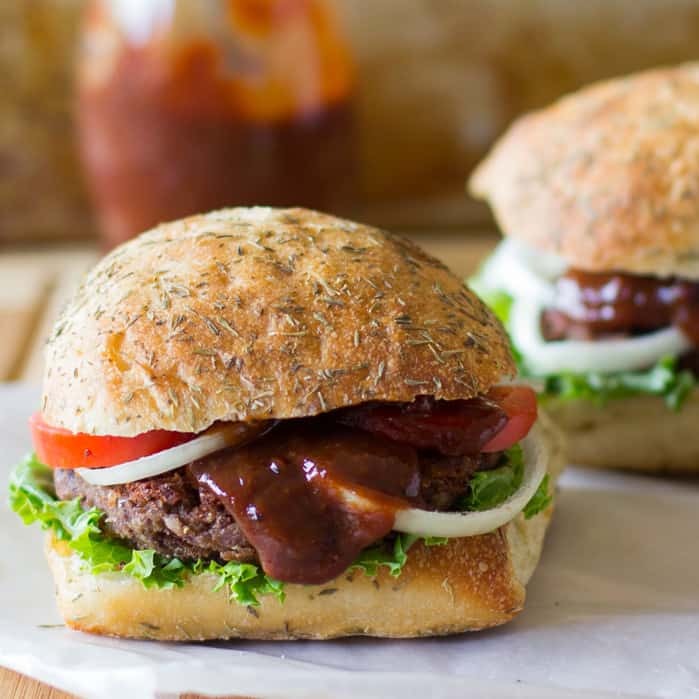 You can make this sauce before the patties are made, to allow the flavours to meld. Mix all the ingredients together thoroughly until combined. Taste test and add a little more salt if needed, or any more of your favourite flavours. Place in the fridge covered until ready to use. In a pan over medium heat, add 1 teaspoon coconut oil. Once hot, add in the garlic and the onion. Sauté for about 5 minutes, then add in the spinach and a pinch of salt and pepper. Saute until the spinach wilts, about 2 minutes. Remove from heat and allow to cool slightly. 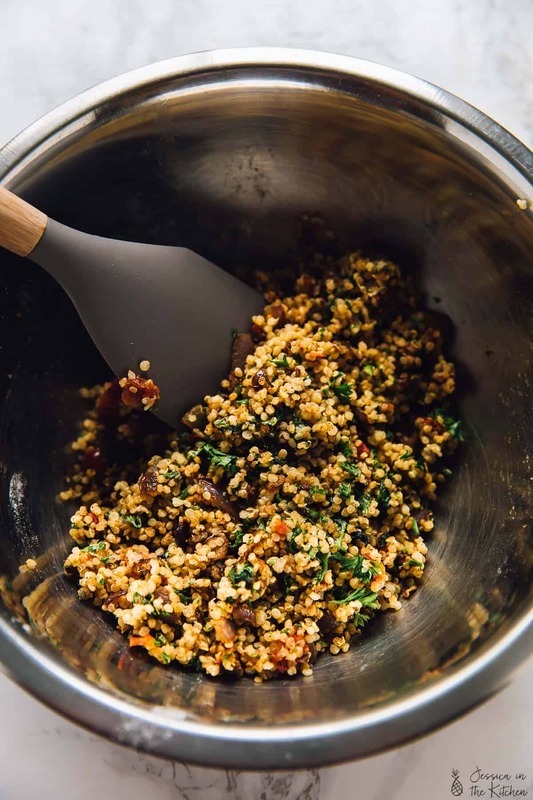 In a bowl, add in the quinoa, the garlic, onion and spinach mixture, the parsley, salt, pepper, egg replacers, flour and tomatoes. Stir together with a wooden spoon to mix until combined. Using a tablespoon measurement, scoop out a heaping tablespoon for one patty. Using your hands, form together into the shape of a small patty. Do this with the rest of the mixture. You should get about ten. In the same pan, add a tablespoon of oil to medium high heat. Once hot, add in one patty. Allow to sizzle and cook on one side for about 2 to 3 minutes while it cooks, then flip and repeat. The pan will get hotter after this, so feel free to turn it down. Add the rest of the patties and cook. You can add them one by one, or as many as you can without overcrowding the pan. The rest of the oil is if you need a little extra. Remove from the pan and onto a paper towel to remove any extra oil from the patties. Allow to cool slightly. 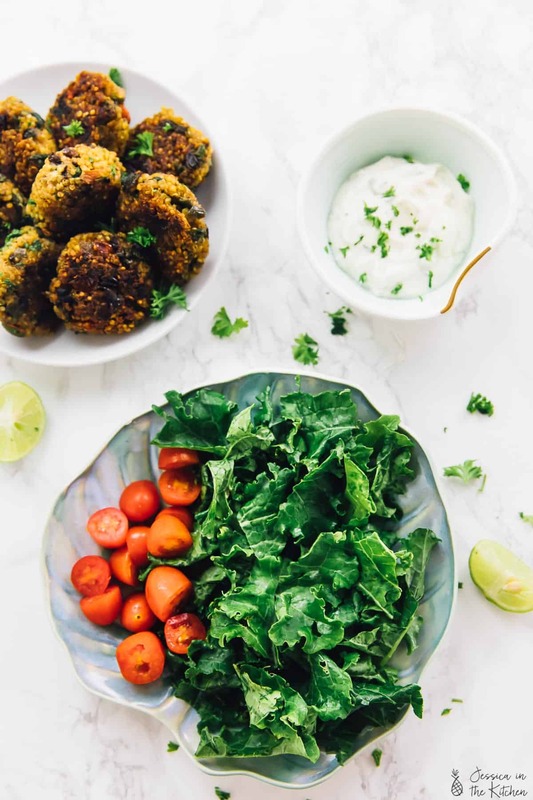 Serve with the yogurt tahini sauce and enjoy! I 100% recommend using an egg replacement like Bob’s Red Mill Egg Replacer, but you can use flax eggs. I haven’t tested it, and I’m not sure if it will be sticky enough. But you can test it, and possible add another tablespoon of flour to the mixture if you need it! I plan to test it with flax eggs in the future! Crispy quinoa patties look great! How much Bobs Red Mill egg replacer?? Thanks! Two Bob’s Red Mill egg replacer eggs! I 100% recommend using an egg replacement like Bob’s Red Mill Egg Replacer, but you can use flax eggs. I haven’t tested it, and I’m not sure if it will be sticky enough. But you can test it, and possible add another tablespoon of flour to the mixture if you need it! I plan to test it with flax eggs in the future! I hope you enjoy!! These were great! I didn’t have time to make the sauce, but I will next time. Instead I dipped them in some tzatziki that I already had on hand and they were wonderful. My son, who is not vegetarian and thinks he doesn’t like quinoa ate some too. Thank you for a wonderful recipe! Tzatziki sounds amazing with this! So glad you enjoy Vivian and so did your son! You’re so welcome and thanks for your feedback! Hi. Can I use olive oil instead of coconut oil? Don’t have coconut oil at hand. Yes you can! I hope you enjoy! !